The tomb of the first emperor Qin Shi Huang was discovered in 1974 and was considered one of the archaeological finds of the century. Thousands of life-size warriors were sculpted from clay and buried with the emperor to protect him, with the complex designed to echo the urban plan of the capital Xianyang. It took approximately 700,000 people 36 years to create the tomb and its clay warriors. The warriors and their horses and chariots are standing in battle formation, and each is unique, with different ranks, hairstyles, costumes and even facial expressions. The first pit contained an army of approximately 2,000 warriors, with infantry, cavalry and archers which have been reconstructed but left on their original positions. The second pit was similar with the third thought to be the command post, containing officers, dignitaries and a cart with four horses. Much of the site remains to be excavated and renovated. The Terracotta Warriors are a must-see of any trip to China and one of the most extraordinary historical sights in the world. 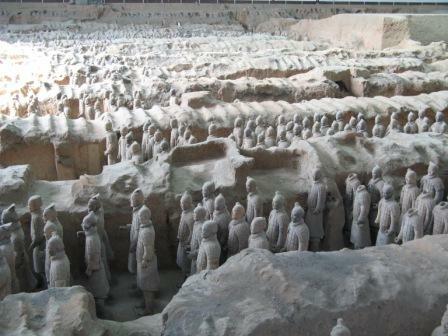 Organised group tours: Click here to see 18 tours to China which may include Terracotta Warriors.